At Edmond, First, two men in a mall hear the Christmas story with the birth of Christ. Some churches no longer have a special Christmas program. Some still do a living Christmas tree. Some do dramas, some do musicals. And some churches are putting a different spin on their Christmas presentations. Tulsa, Calvary is located in the middle of what once was a new and thriving part of Tulsa. Calvary experienced rapid growth throughout the 1950s with many moving into the area to work at the nearby airplane factories. 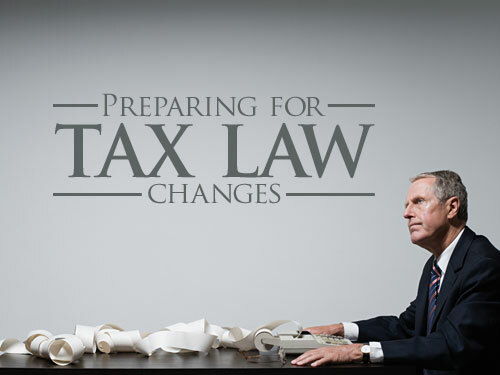 But as is often the case, time brought many changes to the community. Today, Calvary finds itself in a transitioning neighborhood that is ethnically diverse and economically distressed. This has caused the church to rethink how they reach out to their community. In an effort to reach out to families in the community, Calvary began the Academy of Fine Arts this past fall. The goal was to reach out to families who might not have the means to provide fine arts education to their children. The first semester, under the direction of Calvary’s worship pastor, Bruce Cobler, the academy offered piano, guitar, drums and ballet. The lessons were taught by church members and teachers from the local elementary school that the church partners with. The classes filled quickly, and some had to be put on a waiting list. On Sunday nights throughout the semester, each child was given instruction, along with the opportunity to be a part of a children’s Bible study. Many of the parents ended up joining Calvary’s ESL Program (English as a Second Language) or an adult Bible study. The program, which was a great success, retaining almost 100 percent of the students throughout the semester, culminated in a Christmas recital. Calvary has typically done a Christmas dinner theater, but this year they decided to feature the children from the Academy in their Christmas program and allow them the opportunity to show off what they had been learning all semester. This also provided another opportunity to reach out to the students’ families. The recital, on Sunday evening, Dec. 9, drew about 180 people, with about 120 of those from outside of the church. The recital included performances by every one of the students. In addition, Calvary’s worship team led in some Christmas carols, and the children’s ministry acted out the Christmas story. The night ended with Pastor Harvey Sparks sharing John 3:16 and talking about the reason why God sent His Son. 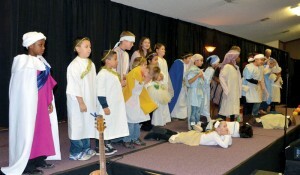 At Tulsa, Calvary, the church’s fine arts students presented the Christmas program. “It was about a couple of men in a shopping mall having a conversation, and ultimately they see a musical presentation in the mall, and the older gentleman prays to receive Christ—he receives ‘The Gift,’” said Haygood. The presentation was done by singers, with actors and choreography as well as light shows. On Friday night, Dec. 7, the church fed about 200 people from homeless shelters in downtown Oklahoma City before the program that was presented just for them. Haygood said there were 14 professions of faith they know of and two other additions to the church. Oklahoma City, Quail Springs also had a special presentation of its Christmas musical for those living in a nearby apartment complex, where a new church start (Truth Church) is being established. 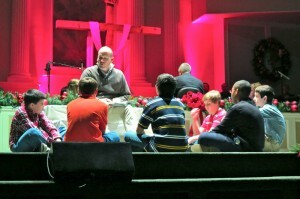 At Oklahoma City, Quail Springs, Mark Jones, children’s minister, tells his class the Christmas story. “God placed a burden on my heart to make the Saturday presentation of the annual choir and orchestra Christmas program an outreach event that would bring in hundreds from the apartment ministry of Truth Church,” said James Bradford, minister of music. Choir members, Sunday School classes, families and other groups from Quail Springs gathered Friday night (Dec. 7) to cover the complex with flyers announcing the performance the next night to be presented especially for those living there. Church members were able to view the performance on Sunday night. Groups branched out over the complex singing Christmas carols and passing out flyers and tickets. Residents were driven to the church on chartered buses for the performance of “It Took a Lamb,” which tells the story of Jesus from birth to ascension. Giving his testimony during the evening was Thunder basketball player Eric Maynor. The church also presented door prizes to the guests. Eight professions of faith were recorded during the evening. “Beyond the benefit of investing in the work of Truth Church, we saw a mighty army mobilized as the Body of Christ should, each part, though varied in function, working together to enlarge the Kingdom of Christ,” said Bradford.